Communist Party leader Petro Symonenko has said that his will not form any coalition with other groups in the new parliament. "The faction will work independently," he said at a press conference at Interfax-Ukraine on Thursday. He said that the new parliament could not work better than the present one, as "there will be a confrontation between the financial, political and clan groups who got seats in the new parliament." The October 28 elections to the Verkhovna Rada of Ukraine were held under a mixed system, with 225 MPs elected on party lists and 225 in single-seat constituencies. 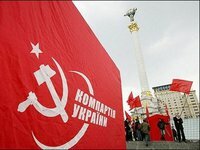 According to the preliminary election results, the Communists received almost 13.2% of the vote on party lists, and thus could get at least 32 seats in the new Verkhovna Rada. The party failed to win any seats in voting in constituencies.